Last week, Los Alamitos’s city council passed an ordinance to defy SB 54, the state’s main sanctuary law that bars local authorities from honoring Immigration and Customs Enforcement (ICE) detainers. On Tuesday, Orange County’s Board of Supervisors voted to join the Trump administration’s lawsuit challenging California’s three sanctuary state laws and condemn the state’s “sanctuary city” law. 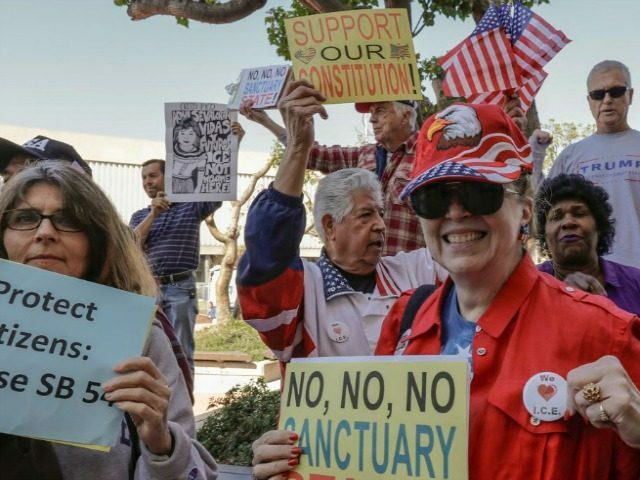 According to a San Diego Union-Tribune report, Escondido Mayor Sam Abed and Councilman John Masson “have put an item on the April 4 agenda that would authorize the city’s filing of a legal brief in support” of the Trump administration’s lawsuit challenging California’s three sanctuary city laws for violating the Supremacy Clause of the Constitution. Abed told the outlet that he expects the measure to pass. Escondido is the first city in San Diego County to consider defying the state’s “sanctuary” laws, and San Diego County’s Board of Supervisors is reportedly scheduled to discuss whether to join the anti-sanctuary revolt on April 17 during a closed session. In Orange County, Mission Viejo voted this week to support Los Alamitos’s ordinance while Buena Park, Yorba Linda, Huntington Beach, and Aliso Viejo are also likely to discuss the matter in the coming weeks.